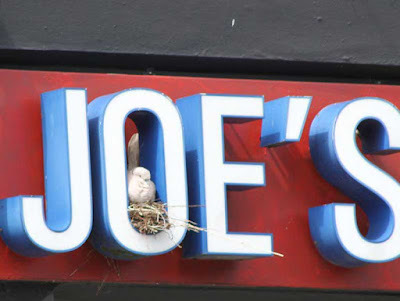 A bird has set up home in a pub sign in Thurso, Caithness, Scotland. The bird, thought to be a dove, has made a nest in the second O of the sign of Top Joes bar. Local councillor Willie Mackay said: “It is obviously not a homer or one that has got lost, it is a typical feral bird who like many will make their home in an unusual spot such as high up accessible ledges on tall buildings.